We are mere weeks away from the next chapter in the Star Wars saga's arrival in theaters, and we've got another new poster for The Last Jedi for the second new poster this week for the film. You can see the previously released IMAX poster here. This new one comes from Dolby Cinema, they revealed their exclusive artwork for the highly anticipated film on their twitter account. The artwork is very similar to many of the other posters we've seen for The Last Jedi, all having a clear emphasis on the color red. 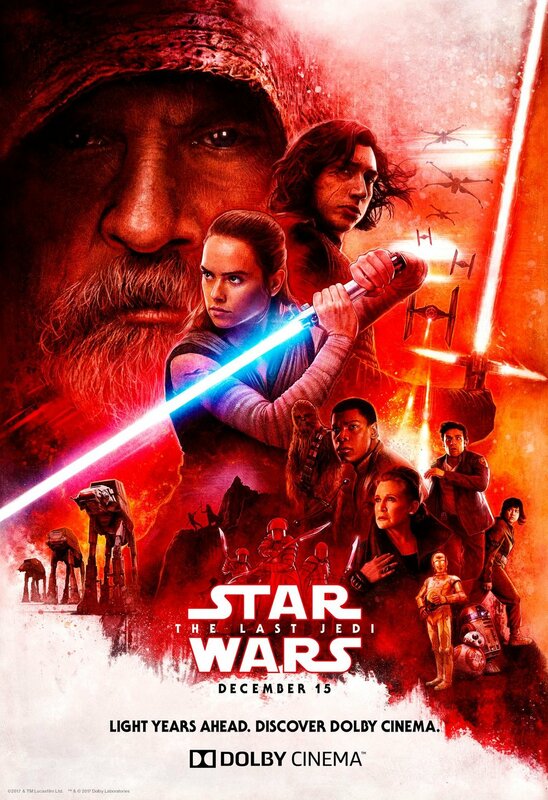 Again Luke Skywalker appears to have a looming, ominous presence over the other cast of characters, Rey and Kylo Ren are prominent as well. The rest of the supporting cast, including Leia, Finn, Poe, Chewbacca and the rest of their allies can all be found scattered around the image. Star Wars: The Last Jedi arrives in theaters on December 15th.